Marwan Sahmarani was born in Beirut in 1970, studied art in Paris, and currently lives between Beirut and Spain. His work reflects his own experiences of the political turmoil in Lebanon, the beautiful landscapes of Spain and contemporary socio-political events in the Middle East and around the world. The artist belongs to a generation of Lebanese that has grown up in an environment of constant conflict, hence violence is a significant theme in his work. He often situates the violence he has grown up with, and that we see daily in the news, within the context of traditional representations of violence in art history by referencing classical masterpieces of European art. By linking the past with the present, and specific events in his environment with universal experiences, he seeks to understand the root causes and motivations for violence, while conveying its physical and psychological impact on those who have been born and raised amidst perpetual strife. Sahmarani won the Abraaj Art Prize in 2010 for a monumental mixed media installation comprising paintings, drawings, ceramics and film. But since then, he has focused on oil on canvas painting. In his latest show at Leila Heller Gallery Dubai, Drifting Island, the artist is showing a recent series of abstract paintings, inspired by contemporary socio-political events, and by nature. His gestural paintings are infused with colour, energy, spontaneity and emotion. One set of paintings focuses on the plight of refugees, with the monumental size of the works reflecting the enormity of the problem and of their suffering. From the seemingly abstract strokes on these canvases emerges a mass of faces and figures — some crowded precariously on boats in turbulent waters, some marching wearily in a mass exodus with only a candle to guide them, and some lined up behind a barbed wire fence, desperately reaching out for help. The paintings evoke the tragic images of Syrian and other refugees that we see in the news daily; and their titles, such as Alep (from Aleppo), Tribute to a Tragedy, and I Had A Dream speak about the trauma and the shattered dreams of ordinary people who have been forced to flee from their homes. 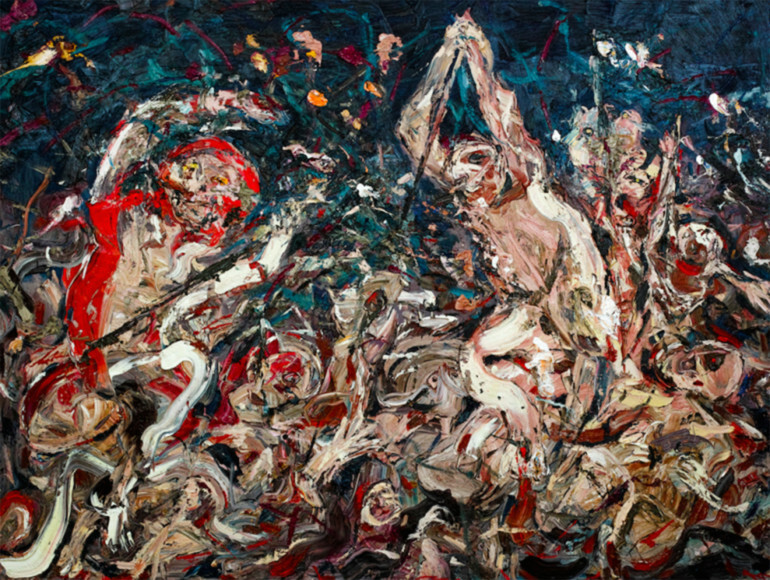 But by abstracting the figures, and placing them in an unspecified place and time, the artist links the contemporary issue of Middle Eastern migrants and how they are being treated by Western nations, to the displacement of people around the world and throughout the history of mankind, raising questions about ideological intolerance and social and ethical responsibility. “I want to understand how people can arrive at a point where they attempt to destroy each other. This appetite for destruction spans human history, and our failure to transcend this destructive force constantly haunts me. I try to investigate this failure, and to explore the raw emotions at the heart of violence,” Sahmarani says. The artist is also exhibiting a series of abstract landscape paintings, inspired by the Spanish countryside. “I come from a bustling city. The first time I was alone in a forest in Spain, I was terrified by the solitude, the silence and the stillness. Overcoming this fear has helped me to liberate myself from trying to focus on an idea, and instead looking and seeing things around me. I now work en plein air, always referencing elements from a real and specific space, and concentrating on transcribing what I see in the moment, and then working on it further in my studio,” he says. 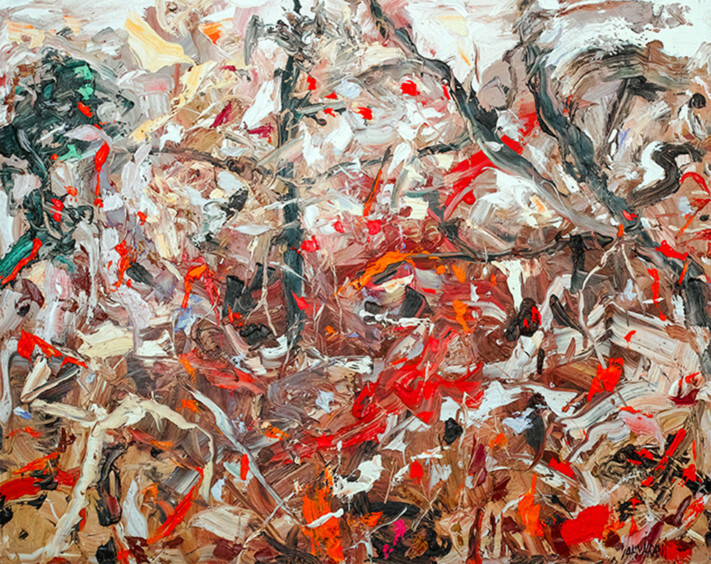 His layered and textured paintings are abstract representations of tranquil forests and picturesque orange farms. They capture the exuberance and vitality of nature. Yet, there is a hint of violence in the way his thick, vigorous brush strokes and bold colours express the brutal force of nature and the primal energy of the elements. Leila Heller Gallery Dubai is also presenting the first solo show in the region by New York-based artistic collective Bruce High Quality Foundation. The collective is known for its absurd and anti-establishment creations that highlight the inherent absurdity and hypocrisy of contemporary global structures and ideologies. The show titled, The Second Coming, combines sculpture, installation, sound, poetry, painting, mythology and the tradition of monument to make a witty and powerful statement about contemporary socio-politics. The centre-piece of the show is a gilded sculpture inspired by the iconic statue of Joan of Arc on horseback, located in the Place des Pyramides in Paris, the site of several marches by right-wing nationalists during the recent elections in France. The warrior saint’s head has been replaced by a table-fan, and speakers are fitted on the head and tail of the horse through which is played a recitation of the poem, The Second Coming, by W.B. Yeats. The poem talks about the falcon not listening to the falconer, things falling apart and anarchy unleashed upon the world. On the walls surrounding the sculpture hangs a collection of eleven tonal grey-on-grey paintings of pigeons, commonly found on the streets in France, and of peregrine falcons, a regal bird of prey, which are both mentioned in the poem. The artists have appropriated an important national symbol connected with war and religion, to speak about contemporary politics, the growing totalitarianism in the world, disintegration of democratic values and of nation-states, and the failure of Western powers to accept and deal with the ongoing effects of their colonial past on current geo-politics. The barely visible birds represent immigrants, seen as pests or predators by xenophobic Westerners, looming over the altered image of one of the founding saints of French mythology. But they are immigrants who can fly where they wish, unfettered by borders. The work thus sounds a warning that the day of judgement is coming and that the call by some for nationalist, religious purity may lead to our collective doom. Drifting Island and The Second Coming will run at Leila Heller Gallery Dubai until June 4.